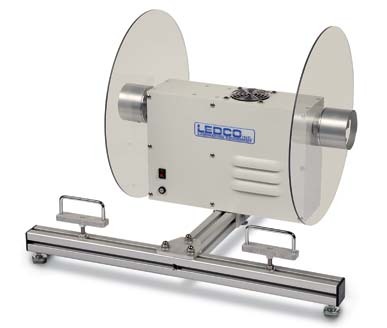 Ledco's Film Scrap Wrapper & Rewinder Can Be Used With Any Roll Laminator and now has 2 year warranty. This 2-spool laminator film scrap wrapper & rewinder is available in 110 or 220 volt electrical and will take up & rewind slitted film scrap off the back of most any roll laminator. Quality American Made construction will last a very long time. We've had one in our own shop since 1994 and never had a problem. Has 2 spools to collect film scrap from laminator's side slitters. Variable Speed: Max Mechanical Speed: 0 to 75 fpm. Max overall rewinding diameter = 15"